I am so excited to share this post! 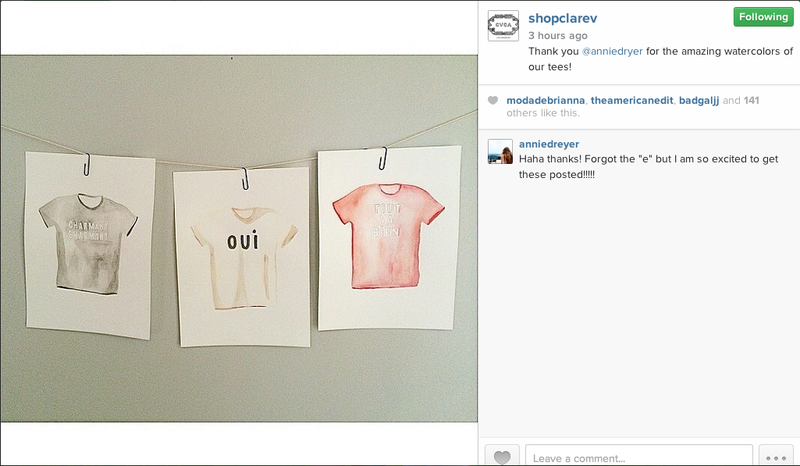 Earlier this week I painted my three favorite Clare Vivier tees, and obviously posted them on Instagram! Clare Vivier liked them herself, and their shop re-instagrammed it!! So exciting!! Awesome, are you using watercolors? They're my absolute fave. Hey Annie! Thanks for your sweet comment! I have been looking around your blog and I have to say that it is awesome. I absolutely LOVE your laid back style and the way you mix it with high end pieces like Madewell! I wish I had that kind of budget and shopped at J Crew. Plus you are a talented artist! I also draw/watercolor and I really like your work and how you shade, its incredibly hard for me to get that kind of detail in. I would absolutely love to follow you!! On my site there is a little widget tab above my photo that directs you to all my social media sites. Cant wait to see more of you content! I followed you on GFC and G+ :) now you follow me on bloglovin and G+! Looks amazing! Want to follow each other on GFC? Wow! Congrats hun! Do You like we follow each other? Visit my blog and let me know please. Follow You now in GFC and G+ keep in touch! Wow great job! Love the paintings :) I just followed you on GFC, thanks for following me. Love the illustrations, You're very talented. Sorry, some computer glitches!!! So, yes to the following and lovely t-shirt drawings! You are so talented!